For such a straightforward part, this has had a bit of a collection of part numbers. Originally, the eye piece was part number 51 (part 50 at the time was the large perforated stand in the HMSD). There was a slight design issue in that the part was only big enough to fit on the smaller strips, as they were the only ones thin enough. In 1923, the part was opened up to fit on the thicker, longer strips. You can see in the photograph to the left the narrower original part and the later wider part. When this was done, the part number was changed to part 50. Part 50a is shown in EMP as gaining a hole in 1929. Thanks to John Nuttall for pointing out that 50a in the manual and MM both of May 1928 clearly has an aligned lateral hole. The eye piece gained a boss in 1928, and another new number. Part 50a is the "eye piece with boss", although the new part 50a replaced part 50 in all outfits. In 1928 also, the boss was drilled to take a lateral axle but remained as part 50a. The part (shown in the photo at the top) remained identical for the next fifty years. 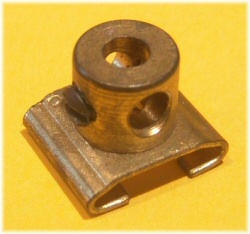 In 1945, the part didn't change, but the part number was changed back to part 50 and renamed "Slide piece". 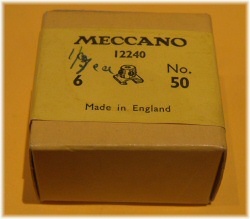 A new slide piece was launched with the Meccanoids outfits in 1979. This was a completely different design, with a plastic slide and a brass pummel. Strangely, the lateral hole was omitted in this part causing much irritation among the builders – suddenly lots of models couldn't be made with the newly designed part! Some Meccanoids outfits (perhaps earlier ones?) come with a slide piece that looks very like the normal type, but still has no lateral hole. 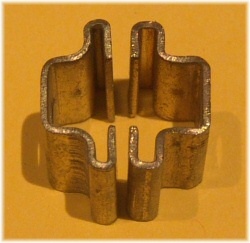 The picture to the left shows both of these Meccanoids parts, which can't be used in the same places as the standard slide pieces. Actually, I'm not at all convinced about this bit. Could anyone please confirm whether they have examples of these please? Well I think we have most of the variations pretty well covered in the paragraph above! However, there was initially an issue in that the bosses were not lined up in any specific direction (like all Meccano bosses). It was soon realised that it was critical in which direction the lateral hole pointed relative to the slot for the strip. Later versions are all lined up, as per the example at the top of the page. The photo to the right shows a spare parts box containing six slide pieces, with yellow label that could indicate any time from 1954 to the mid-60's. Brass and other non-coloured parts continued into the light red/green period with the same yellow labels as before, and rarer parts were still contained in these boxes into the beginning of the silver/yellow/black period (1964-69). Yes, I have at least one Slide Piece with the lateral hole misaligned to the strip slot. The eye-piece also seems to have been produced in nickel-plated steel.